History: Named after Robert A. Irion, who brought cattle to Arizona from Colorado in 1877. Mr Irion setteled in the vicinity of this mountain bearing his misspelled name. He did pronounce his name as Iron. Two years ago I attempted to take on the summit as a simple 4 mile loop. The trail is clearly laid out on the old topo map, complete with switchbacks. The logical approach appears to be a counter clockwise hike. 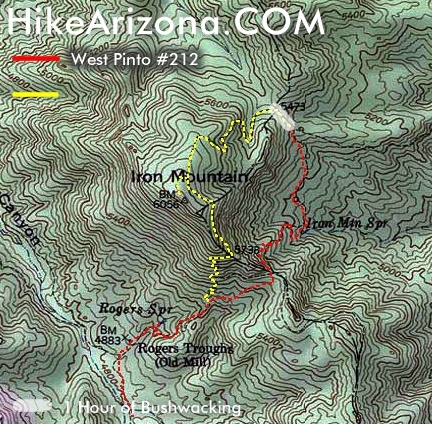 Unfortunately the old trail leading away from West Pinto Trail #212 near the 2 mile mark simply doesn't exist. Well it does exist but it hasn't been maintained in something like 20 years and is completely overgrown. Forget the loop and do this as a short out and back hike. From Rogers Trough head out northwest on Reavis Ranch Trail #109. The West Pinto Trail #212 quickly turns right. Follow this up. As of this writing it's a tad overgrown. Nothing of major concern but I recommend you wear pants for the off trail section. My favorite pair of Teva shorts did take a beating. 0.5 miles up you leave #212 and turn left up the mountain. You can try and follow the old topo trail up. I did pass two cairns and a few patches of distinct trail. However there's no fooling, this trail is long gone. The footing is extremely loose and unstable rock in places. Be careful on foot placement. Evaluate each step as the wrong one will send you flipping backwards into an awaiting agave. The advantage here is little to no bushwhacking from where you leave #212 to the you next destination, the southeast ridge. If you're wise take a GPS loaded with the topo map. Although the trail is nearly non-existent it does get you where you need to go. Which is around a few outcroppings and up to the precise section of ridge. When I got to the ridge I thought it was over. Looking up is a grim scene of thick chaparral. Remember this key piece of advice. Where the topo trail meets the ridge it turns rocky. Just to the right of the ridge is your ticket up. At first glance it looks like a wall of bush. There is a chute up, albeit tight through the bushes and steep on loose footing. Ten to twenty feet up it gets considerably easier. Some minor bushwhacking gets you up the ridge and atop Iron Mountain! I wasn't overly impressed with the views but it sure did feel good to settle this one as done!